Now, as obscure references go, this one takes the biscuit. You’ve no change getting it if you’re outside the UK or under the age of 40 I suspect. Jorn Lande is the Joe Longthorne of metal. Told ya! I cant say that live albums are my favourites, as the best have always been rumoured to be more studio than live versions, and, given the opportunity I would always opt for a live gig over a live album. There’s little interplay with the audience between the songs but that makes for more top quality singing; growling and fierce one moment, almost operatic the next (give that man the ‘Go Compare’ ad.) . ‘Spirit Black’ sails so close to being a Dio’s ‘Straight Thru The Heart’ track its untrue. I can’t say that all the soloing is relevant in this modern era, but with Lande’s feet firmly planted in 1986, its 100% relevant. Both Myrhe and Moren’s solo’s are slightly different as it’s a decent band jam with a bit more substance than your usual guitar wankery. Very surprisingly, there is only one cover that’s included, and I’d never have guessed he’s have gone for Lizzy’s ‘Are You Ready’ which is another great tribute to the great Phil Lynott. ‘War Of The World’ segue’s nicely into a passage from ‘Man On The Silver Mountain’, in tribute to the great man himself and carries it off impeccably. A man in which Lande is keen to emulate now there is a huge gap in the Metal God market place. The whoa-oh-oh-ing from the crowd reminds me also of Maidens ‘Fear Of The Dark’. Production values are excellent, nothing is lost in the mix, and without the audience participation, (he’s that good), it almost seems like a studio album. All in all it sounded a great night. Me? I’d buy it for the DVD and the extras alone! CD 1: Road of the Cross, Shadow People, Below, We Brought The Angels Down, Stormcrow, Spirit Black, The Inner Road, Man of the Dark. 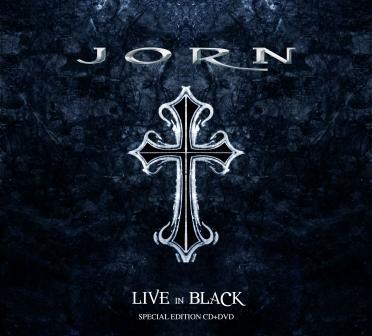 CD2: Blacksong, Guitar Solo (Tore Moren), Tungur Knivur, Guitar Solo (Tor Erik Myhre), Rock and Roll Angel, Drum Solo, Soul of the Wind, Are You Ready, War of the World. 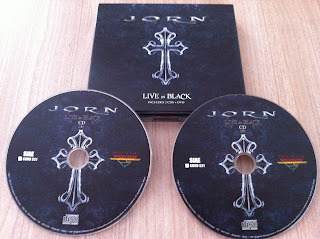 Concert tracklisting: Road of the Cross, Shadow People, Below, We Brought The Angels Down, Stormcrow, Spirit Black, The Inner Road, Man of the Dark, Blacksong, Guitar Solo (Tore Moren), Tungur Knivur, Guitar Solo (Tor Erik Myhre), Rock and Roll Angel, Drum Solo, Soul of the Wind, Are You Ready, War of the World. Bonus Material: Song for Ronnie James (videoclip), Man of the Dark (videoclip).